I’m a huge fan of director James Wan. Anytime I see his named attached to something my expectations go through the roof. This man knows horror. He’s has proven many times that he has what it takes to make a genuinely scary movie. Wan tends to go for much more modest productions. Many of his films cost a small fraction of what others do. He focuses on fewer environments and uses makeup effects to create frightening antagonists with little use of CGI if any at all/ this is extremely rare these days. His ability to create a tense atmosphere is unrivaled with a slow and steady dread that creeps up on you over time. The Conjuring 2 is the sequel to the 2013 film The Conjuring. It’s a damn good horror movie in its own right. You can check out our review for that movie by clicking here. I had no idea what The Conjuring 2 was even about before watching it. It was quite the surprise to see it open claiming that it was based on true events. Not only that but it starts In 1976. Returning paranormal investigators Ed and Lorraine Warren document the Amityville murders at the Amityville house. Hoping to determine if a demonic presence was truly responsible for Ronald DeFeo Jr. mass murdering his family. During a séance, Lorraine is drawn into a vision. She relives the murders and discovers a demonic nun figure, before seeing Ed being fatally impaled. After a struggle, Lorraine is able to break out of the vision. I really liked the introduction to the film. Even if we’ve certainly seen enough of the Amityville murders in the far too many movies that have been made about it. Not only is it shot in a really cool way. It helps to further legitimize Ed and Lorraine as paranormal investigators. One year later, in 1977, the Hodgson family begins to discover strange occurrences within their home in London, United Kingdom. Janet, the second oldest of four children, is seen sleepwalking and conversing in her dreams with an entity who insists that the house is his. Eventually, all siblings of the house and their mother Peggy witness paranormal events occurring right before their eyes, forcing them to seek refuge with their neighbours. When the media attempts to interview the Hudson’s, Janet is possessed by the spirit of Bill Wilkins, an older man who previously lived and died in the house, and who wants to claim his territory. 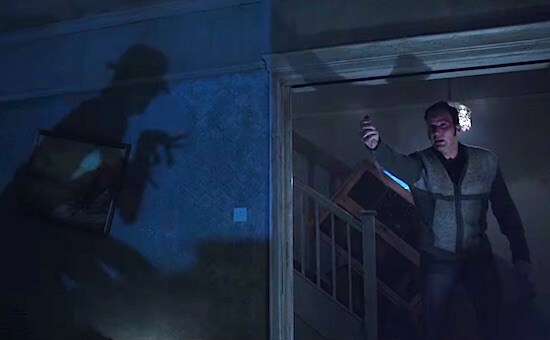 This all might sound pretty familiar to anyone who watched the 2015 adaptation of The Enfield Haunting starring Timothy Spall. Still, don’t be fooled into thinking this is simply a bigger budget version of that highly enjoyable mini-series. Both are adaptions of essentially the same story. Obviously to stay as accurate to the claimed events that took place at the Hodgson residence in 1977. The mini-series focused more on the relationship between Janet and primary investigator Maurice Grosse. In The Conjuring he is portrayed as more of a background character to the Warrens which is much closer to reality. After doing some research, it seems the TV show changed a lot about the story and characters. The movie captured it identically to how it was claimed to have happened. As Janet begins to show more signs of demonic possession, the story eventually reaches the Warrens. They’re requested to assist the local church in the investigation. Lorraine, in fear of her vision of Ed’s death becoming reality, warns him not to get too involved in the case. She reluctantly agrees to travel to London. She has yet another vision of the demonic nun in the collection room. The Nun is an imposing figure indeed. While I found it quite amusing how similar she looked to Marilyn Manson, I cannot deny the level of fear she generates when on screen. James Wan knows how to create formidable looking antagonists in his movies. Whether it’s Mary Shaw in Dead Silence, the bride in black in Insidious or The Nun in The Conjuring 2; you’ll be well aquatinted with them by the time the credits roll. Most movies tend to hide their monsters in the shadows and when the reveal finally comes it’s more often than not a let-down that leaves it feeling not very scary at all. Wan knows when he has something terrifying so he doesn’t allow it to shy away; it will literally stand in full view and stare right back at you. Ed and Lorraine attempt to communicate with Wilkins’ spirit, hoping to talk him out of harassing the family. One night, after the Hodgsons witness Janet being possessed, a video is shown as evidence of Janet purposely wrecking the kitchen as if for a prank. As a viewer it’s plainly obvious that Janet isn’t simply playing some cruel prank but you’ll have to watch to see what happens beyond this point. The Conjuring 2 is a breath of fresh air quite honestly; it is a fantastic horror movie. It’s quite surprising to me that we haven’t seen a main stream movie based on one of the most well documented ghost stories ever. It’s an engaging story from start to finish with exceptional acting from everyone involved. The girl who plays Janet and the other children do really well here. I completely understand the decision to bring The Warrens back; Patrick Wilson is as usual especially likable as usual. Not only does it tell a good story but The Conjuring 2 manages to create a very creepy atmosphere. This is helped along by some very tense moments. The Nun, Bill Wilkins and The Crooked Man who comes from one of those really freaky children’s turntable machines do more than enough to keep you up at night. I couldn’t believe it when I found out that The Crooked Man wasn’t CG. The ways in which he distorts his body is very nightmarish. None of the scares feel forced or without build up. This is always welcome in a genre where jump scares are so prominent. If I were to criticize The Conjuring 2. It would have to be for its claims to be based on a true story. This really annoyed me on reflection. I wish I could just accept it for what it is. I know it’s simply my opinion but I think it’s complete nonsense that anyone could actually believe it to be true. The evidence that “supports” the claims which were documented in 1977 is quite frankly laughable. The credits for the movie show side by side comparison photos to show how accurately they had recreated the event. Which is certainly admirable. I’d just prefer it if no horror movie in 2016 attempted to force upon me that what had happened in it could even possibly be true. I know there are many people out there that find the possibility of it being true terrifying. For me, it just takes me out of it completely. In real life there is plenty of evidence to support the claims that Janet Hodgson was a complete liar. Other than the kitchen incident I didn’t feel like the movie did a good job to show both sides of the coin. There are moments when The Warrens are sceptical about the claims. It just feels forced due to certain things that they had already witnessed.